Son of jazz-rock fusion guitar legend Larry Coryell and author/actress Julie Coryell, contemporary soul blues artist Murali Coryell grew up surrounded by great music - by the likes of Jimi Hendrix, Miles Davis and Carlos Santana. Murali began playing drums at age 8 and continued through junior high school. 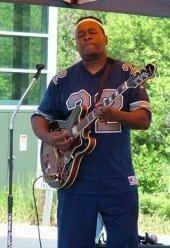 He started playing guitar after discovering the blues in his early teens. "I was into the music of Led Zeppelin, particularly a minor blues tune called 'Since I've Been Loving You'. My dad told me if I wanted to hearsome REAL blues to get B.B. King's 'Live At The Regal' which to this day, I consider one of the greatest recordings ever made. The emotion and sadness in B.B. King's voice and guitar really spoke to me. That's When I first picked up a guitar." He took lessons for a while but picked up most of what he learned from listening to the music of other blues guitar greats...besides B.B., from early Clapton, Albert Collins, Jimi Hendrix and Albert King. The big turning point in Murali's musical career came at age 15 when he attended the National Guitar Summer Workshop in Connecticut. "For the first time in my life I got serious about my music. I started playing all the time. I got into jazz." He joined a jazz ensemble at college, studied classical guitar and graduated with a degree in music theory and composition. He founded a soul/blues band, The Ambassadors, in upstate New York in the late 80s. The band quickly became a regional favorite in New York's Hudson Valley area. In the summer of '94, while a faculty member at the Guitar Workshop, Murali met Duke Robillard who was teaching a master class. Robillard heard me sing at a concert and asked to sit in with my band. He called me a month later and hired me as second guitarist for his upcoming world tour. He featured me on a couple of vocal tunes, Ray Charles' 'I Got A Woman' and Albert King's 'The Hunter'". Soon after, Murali was signed by the fledgling Big Mo Records label as a solo artist resulting in his Stax/Volt influenced debut CD, “Eyes Wide Open” In 1999 Murali recorded “2120” for Marshall Chess' CZYZ label. Rolling Stone magazine named Murali “One promising new hound”. Since that time he's released several albums including 2003's "Strong As I Need To Be", 2005's "The Future Of Blues", the solo acoustic album "Don't Blame It On Me" in 2007, 2008's "The Same Damn Thing" and 2009's "Sugar Lips" as well as a collaboration with his father Larry and brother Julian "The Coryells" (2000/Chesky Records). In additon to performing with his own group, Murali has toured as a featured artist with award winning blues artist Joe Louis Walker and his father, jazz guitar legend Larry Coryell. "He can play beer-soaked blues until last call, and he can also hang with more pop-tinged material-think a grittier, bluesier John Mayer." (Mark Uricheck/Living Blues"
Murali Coryell is known to some as jazz guitar legend Larry Coryell's son, to others he is known as "blues master". Other people call him the "soul man," and yet he can also be seen performing salsa or singing the American and Canadian national anthems at sporting events. The truth is Murali Coryell is all these things and more. One thing everyone can agree upon is that Murali has the voice which invigorates the music whatever type of material he is performing as one fan wrote, "has no explanation, but none is needed once you hear and understand." Murali Coryell was born in NYC October 27, 1969. During Murali's infancy the family moved around a lot living for a time in Scotland with bassist/vocalist Jack Bruce and in California with guitarist Carlos Santana. When Larry's career took off the family moved to a farm in Doylestown, PA where Murali's brother, Julian, was born in 1973. Then moved to Wilton, CT in 1975 and eventually settling in Westport, CT where Murali graduated from Staples High School in 1987. Vocalist, guitarist, songwriter, producer and record label owner Murali Coryell graduated with honors in 1992 from S.U.N.Y. New Paltz. There he studied languages and earned a B.A. degree in music theory and composition. Murali is fluent in French and Spanish and is able to read and speak many languages including Russian and Arabic. He also has a background in acting and theater. Among his first professional jobs were stints as guitarist for folk singer Richie Havens in 1993 and then as guitarist and sometime vocalist for blues man Duke Robillard in 1994. Shortly thereafter, Murali signed his first record deal which resulted in the debut CD "Eyes Wide Open" (released in 1995 and later re-issued in 2000) featuring songs written by Murali influenced by R&B of the 1960's and 70's. Mark Scheerer for CNN's "Showbiz Today" was impressed with a live performance and did a piece on Murali which aired April 15, 1997. Like his mentor Miles Davis, Murali has long had his own melodic and harmonic concept which has been shaped by his own unique musical and life experience. For this reason Murali is credited as producer or co-producer on all recordings that bear his name. Murali would rather not be categorized but would prefer to be recognized as an artist, who as one fan posted on Amazon.com "...has unparalleled rhythm and harmony sense no matter what form of music he touches." 1999 saw the release of "2120" (CZYZ Records). Executively produced by Marshall Chess (formerly of Chess and Rolling Stones Records), "2120" garnered a glowing three star review in Rolling Stone and drew comparisons to Jimi Hendrix and Otis Redding in a New York Times review. In 2000 the release of "The Coryell's" (Chesky Records) chronicled the long awaited collaboration with father Larry and brother Julian in an acoustic exploration of blues and jazz. 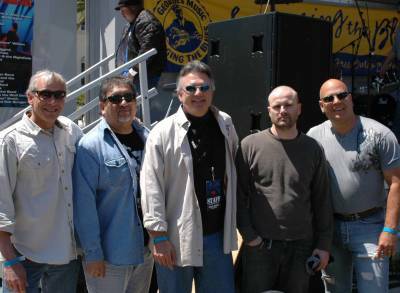 BIG CHILL & THE COLDSWEAT BLUES BAND IS COMPOSED OF PROFESSIONAL MUSICIANS AND IS A SHOW BAND. PEEWEE HAYES, BAND LEADER AND ARTIST, IS A LEGENDARY BLUES GUITARIST AND VOCALIST AND HAS HAD MORE THAN FIFTY YEARS OF MUSICAL EXPERIENCE. IT IS OUR MISSION TO CONVEY THE 'REAL BLUES' TO OUR CLUBS, AUDIENCES, AND FANS. PEEWEE HAS SHARED STAGES WITH SOME OF AMERICA'S MOST LATE AND PRESENT FAMOUS BLUES MUSICIANS. www.myspace.com/peeweehayes. Also on Facebook. 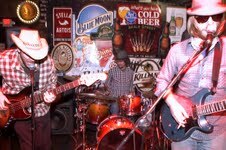 to book this high-energy blues band The Band is willing to travel anywhere within the USA. We are also in pursuit of a promoter. SINCERELY, RESPECTFULLY SUBMITTED. Ghost Town Blues Band recently finished recording their debut album Dust the Dust and they are hitting the road for 2010. This band is a funky and raw power trio lead by Memphis native, Matt Isbell with Dusty Sikes on Bass and Preston McEwen on the drums. Isbell is a strong singer and lead guitarist often compared to a younger version of Gov't Mule's front man Warren Haynes with a voice similar to Greg Allman. Although the band does not consider themselves a jam band, their age demographic tends to disagree and they are opening blues to a new and younger audience. they are definitely a raw, high throttle and sometimes suggestive; a band that takes it to the limit and will have you in bed by 3am. This blonde's got soul. Fresh out of New School in Manhattan, Kristin Trotta is a hot new artist on the New York music scene. Blonde, sassy, and stylish, with a set of pipes to back it up, she is a talent not to be missed. Live performance is her forte – her performance abilities continually leave audiences amazed and her talent easily rivals many of today’s established artists. Kristin’s powerful vocal range along with her signature soulful sound make her music both unconventionally evocative and wildly penetrating: this stuff cuts straight to the heart. Though born and raised near Boston, Kristin has counted herself among faithful New Yorkers since 2003. A graduate of New School University's Jazz and Contemporary Music program, Kristin is professionally trained in jazz vocals and piano. She performs live around New York City and has recorded numerous demos in-studio. Kristin lives in Manhattan, where she continues to hone her craft, and is currently forming a band to perform with her in New York City. VuduBlu can only be described as a band that serves up the blues with a little bit of funk and a whole lotta soul. The band has set its sights on preserving the blues, not just by playing the songs of the great blues masters, but creating its own original brand of blues. The influences of band are obviously guided by the masters that made the blues what it is today. The five members of the band all come from various backgrounds which enabled the band to capitalize on a vast amount of song ideas. If you happen to catch them at a blues festival near you, expect to be drawn in to every conceivable emotion as the band winds in and out of the varied styles of blues.